It’s another nice day leaving Glennallen. Ahead of us lies the last mountain range to cross and we need to gain two thousand feet of elevation. The first twenty miles are a very slight uphill and we make good time. But eventually the hills become rolling and each downhill is a disappointing loss of earned elevation. 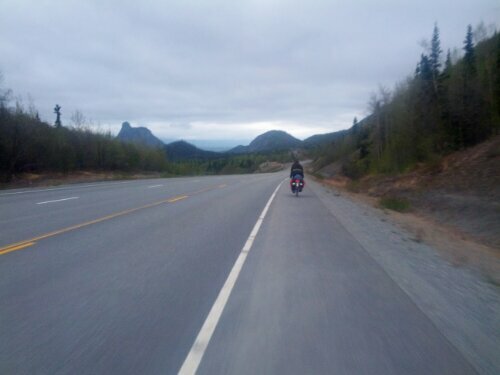 We come across another pair of touring cyclists heading east. These two might be the most talkative yet and they pepper us with questions about the trip ahead – they’re heading to San Diego/ Tijuana. Apparently a truck carrying fruit had an accident thirty miles up and the fruit was strewn all over the road. Supposedly the fruit became up for grabs and so they had plenty of fruit to share with us. We pushed on and soon came upon the long hill leading to the mountain pass. It was not a very steep hill and went rather easily, reaching the top at about 3400 feet elevation. The town of Eureka sits at the top of the pass and we stop in the lone cafe in town for dinner. After a long break we continue only to find that the headwind we’ve had all day has only strengthened. The warm weather of the last few days has also departed and we soon don all our cold weather clothing that has gone unused for the last two weeks. The road is winding downhill now through a wide valley with steep sides. Wanting to make good mileage we press on into the night. The road winds up and down the valley walls and we pass the crashed fruit truck around a sharp corner. A group of moose stares at us from afar before running away. We ride into the brief hours of darkness before pulling over for the night, sleeping only with sleeping bags on tarps to keep things quick. Morning comes and it’s still very cold. We pack up the few things needed and hit the road again. Descending into the valley we ride through fog and before long Donald gets a flat – his first of the trip. Further down the road and it starts to rain. We meet another touring cyclist, this one from England who tells us about a cafe ahead. Guarding the cafe is a vicious turkey. It attacks Donald on our way in, and getting back to our bikes requires a well formed strategy to avoid its deadly peck. The rain is much harder now but we’re only twenty five miles from Palmer, our destination for the day. Every once in a while a brief glimpse of a mountain comes into view, it probably would be very scenic if it weren’t for the heavy rain and cloud cover. We arrive in Palmer and grab a motel. Due to the timing of my mountaineering expedition I have two days to make the eighty miles up to Talkeetna and we decide to take a rest day in Palmer to relax. Before we know it Tuesday has arrived and we’re back on the road. This is where Donald and my paths diverge — we ride together for ten miles and get some parting photos before he rides off south to Anchorage. 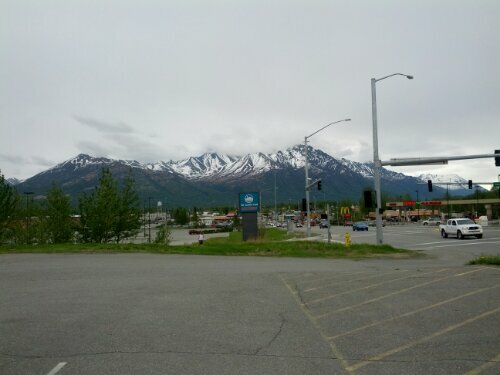 I head west to Wasilla to pick up some groceries and last minute supplies for my mountaineering trip and hit the road. 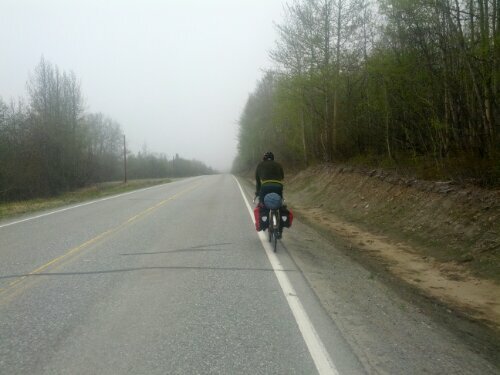 The first thirty or so miles out of Wasilla have a bike path paralleling the road and I am able to ride more comfortably. Unfortunately the recent snow melts have left some sections of the trail flooded and I have to ride through the water with caution. The road turns north and I pick up a nice tailwind which lets me make quick work of the next twenty miles before the bike path abruptly ends. Back on the highway and it first begins to rain before the wind dies down. Before long there’s a long stretch of road construction. Cars have to wait a while before following a pilot car through the seven miles of construction. The flagger tells me I will need to get a ride from the pilot truck but I luckily get permission to ride on through. No cheating allowed. The asphalt has been removed for this stretch and I have ride through dirt and gravel, stopping periodically for construction vehicles or traffic to pass. Between the mud and puddles I ride through and all the muddy water splashed on me by passing cars I get pretty dirty. It’s at this point that the van carrying all of the members of my expedition passes me, stopping ahead a bit for the guides to come out and say hi. 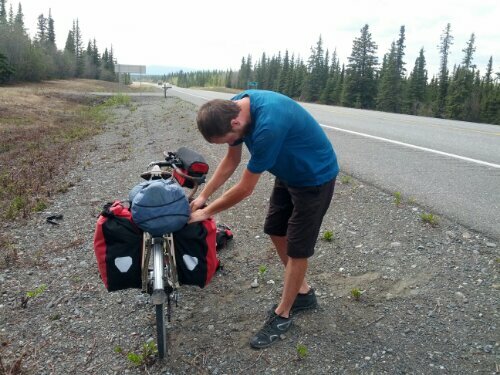 It’s twenty five miles now to Talkeetna so I kick it into high gear. 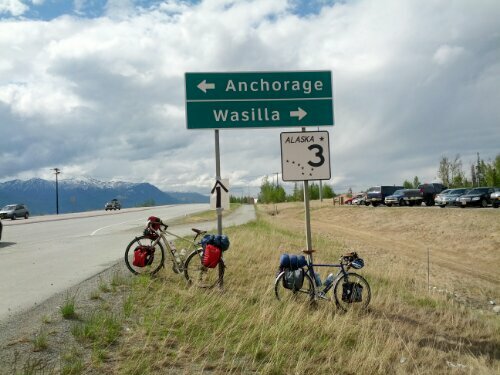 My tailwind has subsided but I manage to average eighteen or nineteen miles an hour for the remaining time to Talkeetna. Covered in mud and tired, I check into my motel, take a shower, and join my group for dinner. http://www.rmiguides.com/blog/category/12/mount_mckinley – look for entries from Jake Beren. Upon my return I’ll have a final post with a full photo album but that won’t be until mid July. Until then!